Campagnolo Black & White Oblong Stickers. 12" Pair. Campagnolo Curved Wheel Stickers. 2.25". Set of 5. Campagnolo Curved Wheel Stickers. 3.5". Set of 5. Campagnolo Curved Wheel Stickers. Thick Style. 3.5" or 4.5". Set of 5. Campagnolo Curved Wheel Stickers. Thin Style. 3.5". Set of 5. Campagnolo Curved White Text & Tricolore Style Stickers. Set of 4. 3". Campagnolo Cut Vinyl Script Style Sticker. 12". Campagnolo Cut Vinyl Text Stickers. 8" Pair. Campagnolo Made In Italy Wheel Stickers Set of 5. Dark Blue & Gold Foil. 2.25". Campagnolo Orange & Purple Striped Stickers. 4", 6" or 8" Pair. Campagnolo Prodotti Speciali Black Globe Oval Stickers. Set of 4. 1" or 2". Campagnolo Prodotti Speciali Coloured Globe Oval Stickers. 30mm Set of 4. 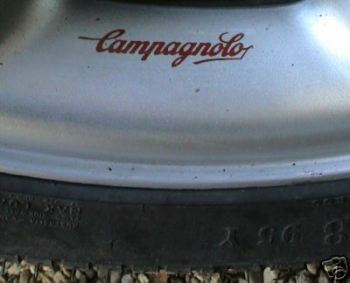 Campagnolo Prodotti Speciali Oval Stickers. 4" Pair. Campagnolo Racing Wheel Stickers. 40mm. Set of 8. Campagnolo Red & Black Wheel Centre Stickers. 50mm or 55mm. Set of 4. Campagnolo Script Wheel Stickers Set of 4. Black & Clear. 2.75". Campagnolo Script Wheel Stickers Set of 5. Black & Clear. 2". Campagnolo Script Wheel Stickers Set of 5. Black & Foil. 2.25". Campagnolo Script Wheel Stickers Set of 5. Red & Clear. 2.5". Campagnolo Script Wheel Stickers Set of 5. White on Clear. 2". Campagnolo Short Text Wheel Stickers Set of 4 . Black & Clear. 4.5". Campagnolo Silver & Black Globe Logo Wheel Centre Stickers. 50mm. Set of 4. Campagnolo Text & Tricolore Style Stickers. Set of 4. 1.5". Campagnolo Text Wheel Stickers Set of 4 . 3". Campagnolo Wheel Centre Stickers. 50mm or 55mm. Set of 4. Campagnolo White Text & Tricolore Style Straight Oblong Stickers. Set of 4. 3".